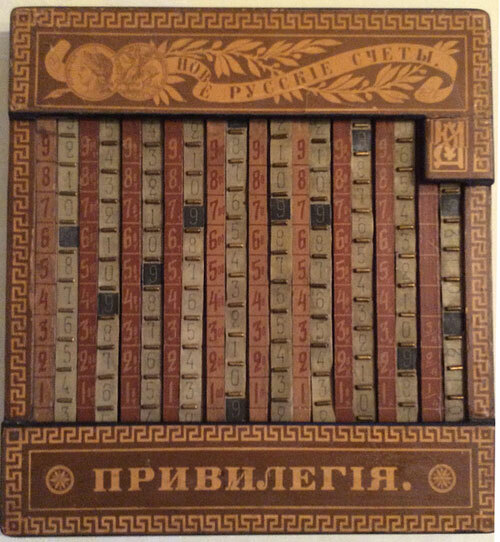 Around 1874, the Russian military engineer from S. Petersburg, captain Juri I. Diakov (Юрiй И. Дьяковъ), devised a simple row adder, one of many adding devices based on Abaque Rhabdologique of Claude Perrault. This simple and cheap device went in production in the late 1870s (see the lower image of a device from 1880s). 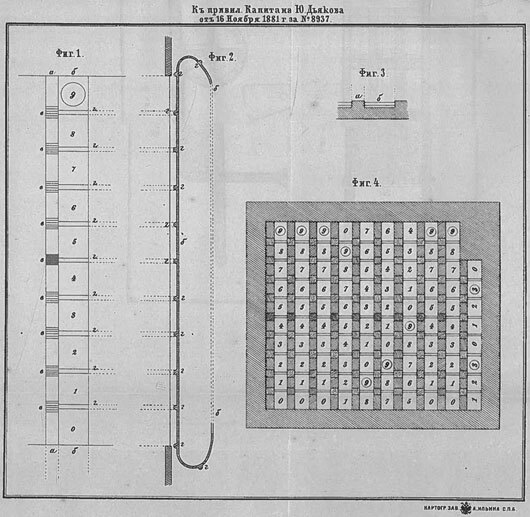 It is believed that Diakov was the inventor of several interesting calculating devices, which were granted with a medal on 1878 Exposition Universelle in Paris. It was a simple stylus operated calculating device (dimensions 33 x 31 x 3 cm), with tens carry. On 16 Sep. 1880 Juri Diakov applied to the Russian Department of Trade and Manufacture for a 3-years (later prolonged for 10 years) privilege (привилегия, i.e. patent) for the device. The privilege №8937 was granted on 16 November 1881. It seems the device achieved a considerable market success until 1881, because the state tax for the privilege was quite big—450 rubles. The principle of Diakov's abacus will be further improved some 10 years later in the Ribbon Adder of Charles Henry Webb and later in several other devices like The Basset Adder.